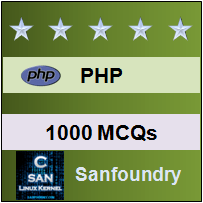 This set of PHP Multiple Choice Questions & Answers (MCQs) focuses on “For Loops – 1”. 1. What will be the output of the following PHP code ? Explanation: Wrong syntax for for loop. 2. What will be the output of the following PHP code ? Explanation: This runs a for loop for that array. 3. What will be the output of the following PHP code ? Explanation: This runs a for loop from 0 to 10. 4. What will be the output of the following PHP code ? Explanation: The value of x is incremented and printed twice before checking,this last loop it prints 11 and 12. 5. What will be the output of the following PHP code ? Explanation: Loop runs from 1 to 9 i.e 9 times. 6. What will be the output of the following PHP code ? Explanation: The value of x is decremented thus making it an infinite loop. 7. What will be the output of the following PHP code ? Explanation: The loop is not even entered as x is initially 0. 8. What will be the output of the following PHP code ? Explanation: The loop runs only once as value of x is incremented. 9. What will be the output of the following PHP code ? Explanation: The loop does not run as i initialized in check statement will be zero. 10. What will be the output of the following PHP code ? Explanation: The loop never exits as the condition ++X == X is always satisfied,evaluated from right to left.